Check the #freekg hashtag on Twitter, which is aggregating all of the relevant links. Some of these tweets are in Russian, but Google Translate — http://translate.google.com/#ru|en| — works a charm to get a rough and ready translation in seconds. Trilling’s latest piece for Eurasianet, “Bishkek Hesitant as Otunbayeva Forms New Government,” gives a very good sense for how things are now in the Kyrgyz capital. Following my 845-word discourse on the Roghun Dam and Hydropower Station a month ago, the forced purchases of shares in the project continues apace and banners proclaiming Roghun’s importance to Tajikistan continue to flutter all over the streets of the capital. In the meantime, Uzbekistan has demanded that there be no construction on the dam until an independent commission researches the issue and has arrested a Tajik border guard who wandered across the frontier to retrieve a wayward cow. Seriously. From Neweurasia.net: Are we heading toward Roghunarok? Sometimes the overwhelming shoddiness of Tajikistan strikes me. Finish painting (see below)? Nah. Finish paving (see above)? Nope. It’s impressive when a hole in the road manages to swallow a decent-sized chunk of truck. It is even more impressive when this happens within sight of the so-called “Palace of Nations,” the president-decreed and Orwell-named monstrosity that resulted in the razing of an entire neighborhood. Sure, let’s spend hundreds of millions of dollars on a gauche eyesore that looks like Versailles as designed by Imelda Marcos that no one even uses. Let’s do this while people in the countryside starve, huddled in their dark, mud brick hovels. But to not even bother to pave the road a couple hundred feet from the gates of said “palace” and across the street from the KGB headquarters? Well, that’s just laziness. Actually, I probably shouldn’t rule out ineptitude. It is entirely possible that this road was paved relatively recently, but that that workmanship was so bad that it just disintegrated post-haste. 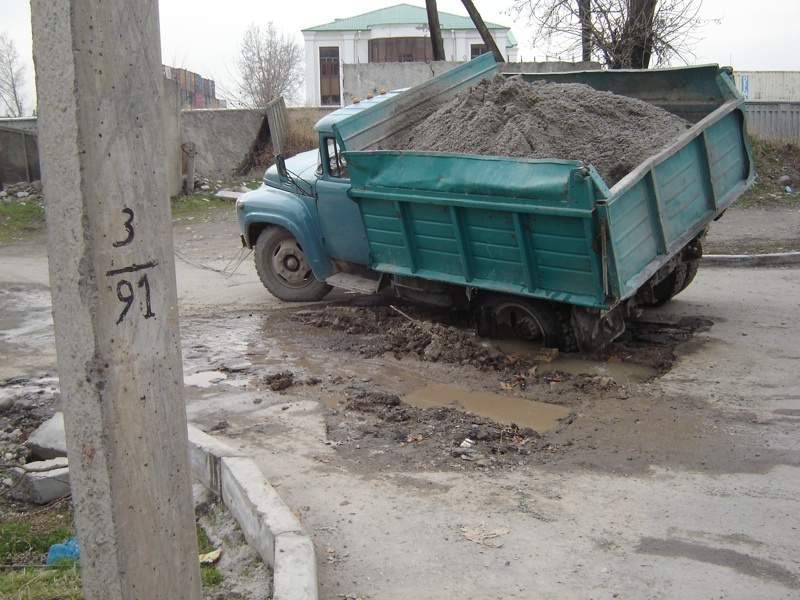 Living around civil engineers for years at university didn’t teach me what subsidence means; within weeks in Tajikistan I couldn’t help but learn what it means, as I traveled over road after sunken road that were sinking due to poor engineering. I googled potential ways to avoid this in about 0.45 seconds, but why bother when you can just let the road fall apart, right? There’s lots to love about this odd, little obscure mountainous country. The inability to make things work ain’t one of them. A SIDE NOTE: According to the VOA, among others, there was a significant earthquake in the Vanch district of Tajikistan, about 400 km from Dushanbe. If my friends who read about the earthquake from abroad hadn’t asked if I was okay, I wouldn’t have known a thing about it. We didn’t feel a thing in Dushanbe. Luckily, it doesn’t appear anyone was killed in this latest quake. DUSHANBE, April 30, 2009, Asia-Plus /Nargis Hamroboyeva/ — Saydmurod Qodirov, who had previously served as the first deputy prosecutor of the Khatlon province, was appointed the Dushanbe prosecutor, replacing Qurbonali Muhabbatov, according to the Dushanbe prosecutor’s office. Muhabbatov who had served as the Dushanbe prosecutor since 2007 is currently at disposal of the personnel department within the prosecutor-general’s office, the source said. Cryptic and not exactly hard hitting, no? I feel there’s a story there just waiting for a journalist. Today’s e-mail had something of interest to Americans, however. “Montana University,” which my sleuthing (aka Google) determined to be University of Montana at Missoula, recently opened a “Tajik Corner” in its student union. A bit more online digging led to my discovery of UMT’s Central and Southwest Asia Program, which is one of a precious few of its kind in the U.S. The University of Montana Press even published a new book just about Tajikistan.